Happy birthday to your lips! Wait until you see how to transform the ultimate birthday treat into a sugary lip balm you’re pretty much guaranteed to adore. Sprinkled with some extra love (and actual sprinkles, of course), this balm will leave your lips feeling as soft and smooth as freshly made frosting. Created with just a few key ingredients, including beeswax, coconut oil, and vitamin E oil, this confection will protect your pout while adding some extra (tasty) moisture. Not to mention the requisite touch of vanilla essential oil for a warm, sweet scent. 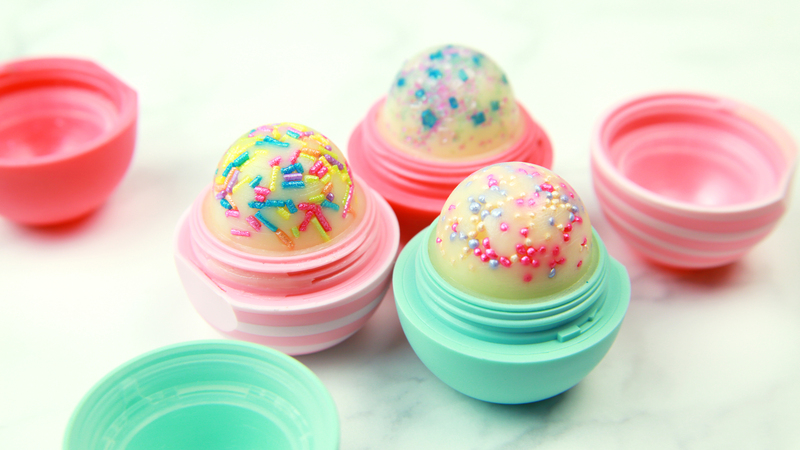 Every time this lip balm touches your lips it will feel like a sugary celebration. Check out the video below and you’ll see how easy it is to sprinkle together this DIY cupcake lip balm! 1. Add beeswax pastilles and coconut oil to a microwave safe pitcher and microwave 1 minute. Stir and if not fully melted, microwave an additional 15 seconds. 2. Add vitamin E oil and essential oil and stir until fully combined. 3. Apply a thin layer of petroleum jelly to the container lid. Add some sprinkles and spread them out evenly. 4. Separate the middle piece in the lip balm container base by inserting a knife in-between the two pieces and wedging it out. 5. Screw the middle piece onto the lid. 6. Pour the lip balm mixture into the lid, filling it just past the grating. 7. Wait 15 minutes for it to harden, or put it in the fridge for 5 minutes. 8. Line up the indent in the middle piece and base and pop the base back on.